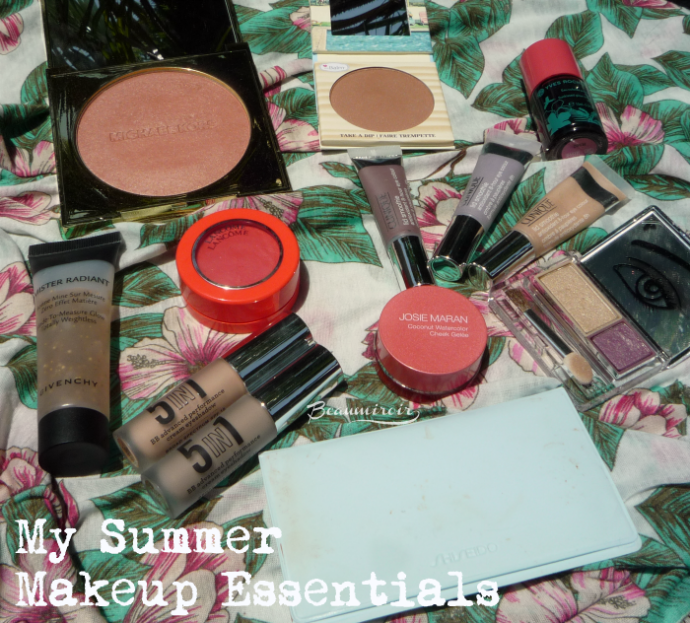 Our summer series continues today with a focus on my favorite makeup products for the warm season. 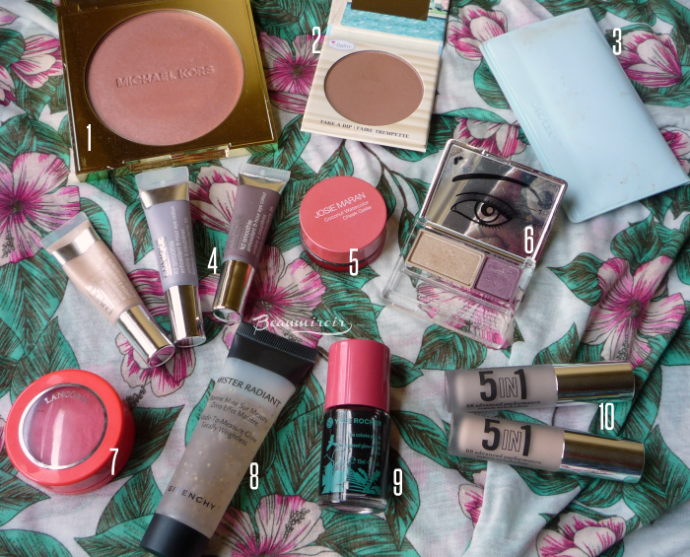 Most of these items are not new, they're the handful of products that I kept using all summer long last year and started reaching for again in the past few weeks. They're the ones I would have a hard time replacing if they went away, because I simply can't live without them in the summer! I'll show you my favorite lippies for the season in a separate post, so come back next week for my top lipstick or glosses! 1- Michael Kors Bronze Powder in Flush. I reviewed it last year, and am still in love. This is a pearly pinkish beige, so definitely not a contouring shade, but one that gives you that healthy, sun-kissed glow in one brush swipe. 2- theBalm Desert Balm Bronzer/Blush. I bought this one very recently, but it wowed me the first time I tried it, and I've been wearing it almost every day since then. This is another glowy bronzer shade, but much more neutral than Michael Kors' Flush. The very flattering color and finish together with the easily blendable texture make it a must in my book. 3- Shiseido Pureness Oil Control Blotting Paper. I have this with me at all time during the summer to control the shine on my T-zone. You can probably tell by the look of the plastic pouch that I've had it for a while! They absorb the excess oil on the skin without affecting foundation, and the Shiseido Pureness have an oil controlling powder on them that helps keep skin fresh-looking longer after use. These are good but a bit pricey, and more affordable options can also work wonders. 4- Clinique Lid Smoothies. I've been using these delightfully fresh cream shadows since they were launched about 4 years ago. They're light and fluid, most are shimmery, and the metal applicator provides a wonderfully cooling effect to the lid. They're great for a sheer wash of color on a warm day. Pictured here are Bit O' Honey, Born Freesia and Current Affair. 5- Josie Maran Coconut Watercolor Cheek Gelée in Poppy Paradise. A fresh and juicy cheek gel that applies like a sheer stain. I doesn't look like much when swatched, but it gives me a beautiful, natural flush, and I like how light the texture is in the summer. 6- Clinique All About Shadow Duo in Beach Plum. I reviewed that one a while ago. The beachy shades are perfect for a light summer day look, and it's easy to work with. It's the duo I go to when I want a simple, flattering eye look and I don't want to use cream shadows. 7- Lancôme Blush Subtil Crème in Corail Alizé. That's the other newcomer in the selection, and I reviewed it very recently. The shade just screams summer, and it gives me a very natural red coral flush that brightens my entire face. 8- Givenchy Mister Radiant. This refreshing clear gel contains tiny beads in brown and gold shades that pop when applied to the skin and give the face quick, blendable faux tan. It's fun and I like to use it when I'm going bare-faced (it only really works on bare skin). It's being re-promoted as part of the Givenchy Croisière Summer 2015 collection, but as far as I know, it's part of the permanent line. 9- Yves Rocher Sunkissed Glow Cheek Stain. This product was an LE from a few summers ago and it's not available anymore, but I just couldn't leave it out. It's just genius. This is a completely liquid bronzer that gives me the most natural bronzy stain on my cheeks. Nobody can tell I'm wearing makeup when I use it, it just looks like I have a tan. There are not very many liquid bronzers out there and none seem to compare. By Terry had one, but it was also LE. The only ones I know about right now are Armani Maestro Liquid Summer and Perricone MD No Bronzer Bronzer, but they both look milky, while the Yves Rocher one is a clear watercolor shade with a bit of golden shimmer. 10- bareMinerals BB Cream Eyeshadows. I reviewed the shade Candlelit Peach a few months ago, and subsequently bought Spice Elegant Taupe. They really brighten my discolored lids, and the great thing is that they have an SPF15. Living in San Diego where the sun is particularly intense in the summer, this is a great way to add protection to my makeup routine. + 1 that I totally forgot to include in the pictures: Smashbox L.A. Lights in Silver Lake Sunset. This stick blush is very luminous and gives me a hint of peach and the most beautiful sunset glow. I reviewed it here. 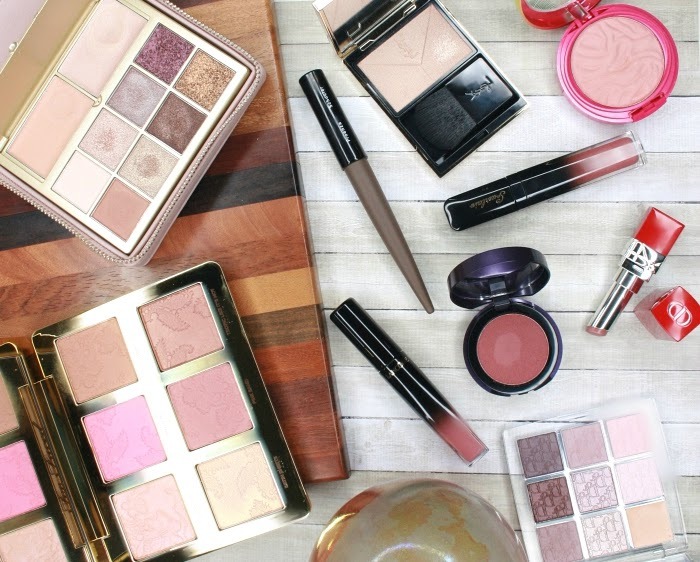 What about you, what are your summer makeup must-haves? 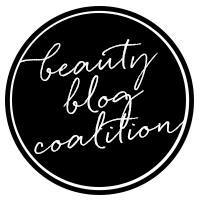 Do you go all bronze for beach looks or do you keep using the same products year round? Where to buy? Take a look at the widget below for retailers and prices. 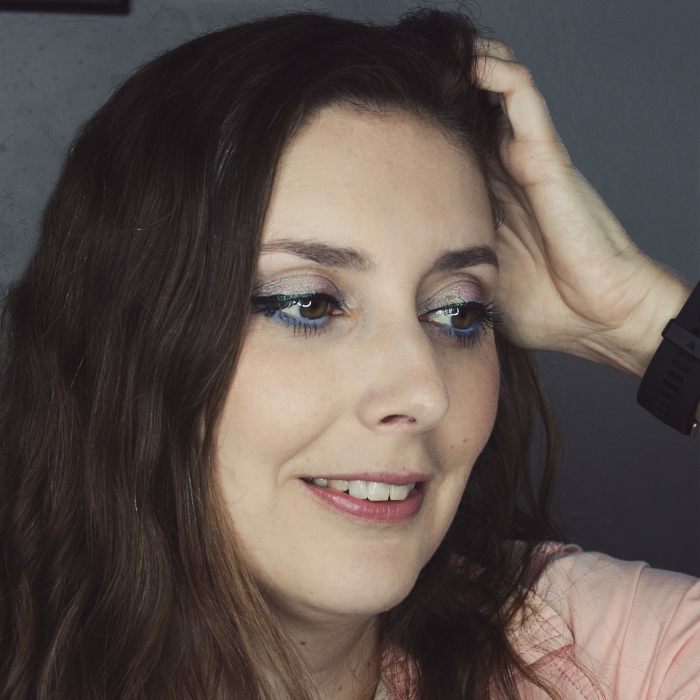 The products featured in this post were all purchased by Lulle, except for the Clinique Lid Smoothies in Bit O' Honey and Born Freesia, which were PR samples. I received no compensation to write this post, which only reflects my personal opinion. This post contains affiliate links. You inspire me every time! Love this! Oh, I had almost forgotten about the Lid smoothies. I really wanted to try them when they released, but never got around to. They're pretty good for light makeup, I think you'd probably like them! Trust me that bronzer/blush is really beautiful. Too bad the Josie Maran Gelee doesn't show up on you, what shade do yo have? Maybe a brighter shade would work better? It looks super sheer when I swatch it, but somehow it gives me a very visible flush on my cheeks. What a great list! I seriously need that Lancome blush in my life! I've seen it around, but haven't seen it at my local Lancome counter. I really want to test it in person. Maybe I'll stop by this week and see if they have it. It really is pretty! Last time I went to a Lancome counter (about 2 weeks ago) they were sold out. I hope you can find it in a local store! In the US Michael Kors is exclusive to the brand's own website and Macy's, but I'm not sure where it's sold in Europe! Blotting papers are such a must-have for me! I don't have super oily skin, but I do shine a lot when it's hot. They saved the day so many times! I rub it between my fingers to pop the little beads before putting it on my face (otherwise I can have a brown cheek while the other is golden...) but it's quite subtle, although it gives me a noticeable "tan". Thanks for the tip! I hadn't heard of that brand. I've read about the ones by Muji, but haven't tried these ones yet either.